The leaves are known in Thai as bai cha-phloo. In some Asian supermarkets they may use the Vietnamese spelling of "La Lop" leaves. In English they're known as piper sarmentosum or "Betel" leaves. Somewhat bitter, the taste is perfectly suited for miang kham. Or you can wrap just about any Thai food in the leaves, such as fried rice with a peanut or two, and pop them into your mouth. We even wrap french fries with these leaves and dip in a variety of sauces. Delicious. The leaves are sold in bunches (see photo below). Leaves are 3-4" wide. These leaves are commonly used in Thailand as a simulant, if mixed together with limestone paste. ImportFood.com is a recommended supplier in Saveur Magazine in 2004 and again in 2010. Our customer Malee in Miami FL sent us this email: "My sister is a miang khem addict. Every time she comes to Florida from NY she has to gather up as much bai chaploo (Thai betel) as she can carry back on the plane with her. I moved to another house and was having trouble transplanting and getting it to grow in the new soil, so when she asked me to bring her some on a recent trip, I was really hard-pressed, so I ordered it from Importfood.com and had it shipped to her! Thanks for saving the day!" Order now and we'll send you three large bunches (one bunch seen to the right), packed carefully in a strong box to ensure good arrival. Priority Mail is a 2-3 day service, ship date specified below. Please Note: if you order only fresh produce, select "$0.00" as shipping charge at checkout (because the price above includes shipping). If you order fresh produce and any other items, you must checkout with "UPS Ground" as the shipping method, and you will receive the other items separately. We pack the produce carefully and ship every Mon/Tues/Wed via USPS Priority Mail (2-3 day delivery) to ensure freshness. Occasional delays due to Mother Nature & harvest conditions. Call 888-618-8424 if you need a definite delivery date. Lately, new restaurants in NYC and Chicago are becoming popular with the betel leaf on their menu, creating dishes such as "Chicken betel leaf w/roasted shallots & eggplant". The betel leaf is coming into it's own. We get fresh betel from a farm in Hawaii, year-round. The leaves are hearty and strong, and will last for a good 3-4 days after you receive them. 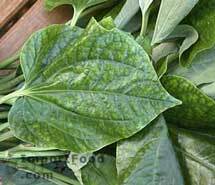 Perhaps you might like to try the sensational fresh betel leaf. As a special, we are offering two different kits, both shipped via 2 Day shipping to arrive fresh and ready to enjoy. Expedited to your door via 2 day shipping to ensure fresh delivery (upgraded at no charge). If you order a kit below, checkout with Fedex Ground as shipping method. We'll upgrade it to expedited 2 day at no extra charge. Betel Leaf Fresh Kit w/Palm Sugar and Dried Shrimp. The same ingredients above, plus 1 palm sugar and 1 dried shrimp.